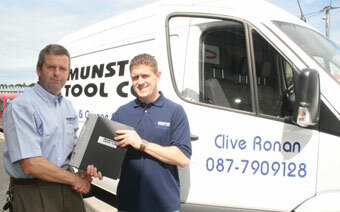 Leinster Welcomes Munster Tool Co.
Cork based Munster Tool Co. has launched its 10th franchisee: Clive Ronan who is covering the Wexford & South Wicklow territory. The franchise supplies tools and equipment to the automotive, agricultural, plant hire, HGV and allied industries, and is half way toward its target of 20 franchisees by the end of 2009. 'Being one of our franchisees has a number of important benefits,' says Donal Healy (pictured above (L)'with Clive), who co-founded the company with Martin McMahon in 1980. 'The fact that the Munster Tool Co. name is synonymous with the automotive trade for over a quarter of a century means that franchisees enjoy instant brand recognition. Donal and Martin launched the Munster Tool Co. franchise opportunity in 2004, assisted by Eamon Curtin of Franchise Development Services Ireland. The company operates from a modern computerised administration centre and warehouse in Mallow and its fleet of state-of-the-art sales/demonstration vans support its growing list of customers.